Villa Sofia is a private oasis in the middle of verdant gardens in Koh Samui, Thailand. 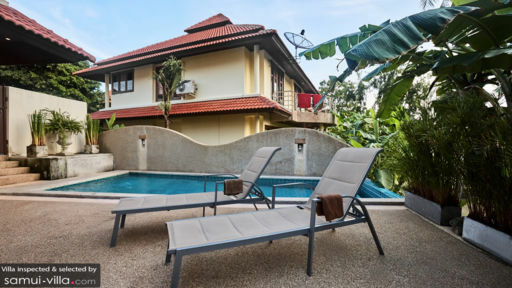 The three-bedroom holiday haven is located right off the sea, close to the famous Big Buddha nestled snugly in a tranquil and quiet spot. Enjoy the peaceful and calming atmosphere of Samui while you relish the comfortable ambiance of the villa itself. Ideal for small families and friends, Villa Sofia is the perfect spot for relaxation, rejuvenation, and some good old tropical adventure close to the sea and sandy beaches! The three, air-conditioned bedroom suites at Villa Sofia offer a cosy and relaxing space to guests to which they can retire to at the end of a long day of roaming around the island of Samui. The rooms are located on the first floor of the villa and also connect to a private veranda with sitting, to enjoy the view of the neighbouring areas on the island. There are double beds in each bedroom and large windows to ensure there is ample outdoor lighting. One of the bedrooms has an en-suite bathroom and the other two can share the family bathroom on the same floor. Surrounded by the verdure of tropical gardens which boast of towering palm trees, dense bushes, and exotic flowers enveloping the area with a sweet-smelling languor. A sparkling, tiled-swimming pool sits comfortably amidst a pebbled pool deck and natural greenery. The lush gardens add a much-needed respite from the otherwise busy city streets, and you can breathe in ample fresh air to ease all your worries and feel at once, relaxes and well-rested. There are sun loungers on the pool deck, ideally for some lounging or to work on your holiday tan! Just in the corner is an outdoor chair swing, which is the best spot for book lovers, where they can dig in and lose themselves within the pages of a good book. 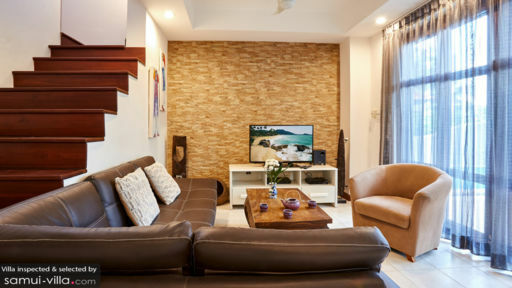 Beside the swimming pool and garden, you will find the expansive and modern living area furnished and decorated to offer a comfortable and restful corner for you to relax in. The sitting area is furnished with plush, leather couches and armchairs that are extra comfortable and you can lie back and take naps while you enjoy the calming ambiance. A flat-screen TV is also placed facing the sofas, so you get to enjoy watching some films while you’re at it! The space is designed to provide a modern aesthetic with minimal décor and crisp uniformity to add an opulence and luxurious vibe. The air-conditioned can otherwise be opened out to the pool deck. The living area shares space with the dining and kitchen area as well, that are equally well-furnished. There is a large, wooden dining table which seats six people comfortably placed in the middle of the room. A modern, well-equipped kitchen is also accessible by guests, where they can cook up a storm if they so wish, making use of the ample appliances and amenities available to them. A lounge area is also prepared for the guests, with a great view and a comfy couch for some reading or a nap. The villa complex offers several services to its guests including cleaning service twice a week and it is guarded by a security guard to ensure the safety of its guests. There are other services that can be got on request such as in-house massages, car/scooter rentals, and island excursions to discover Samui! 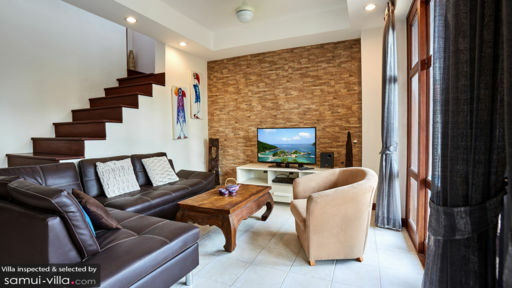 Villa Sofia is in a relatively quiet and serene corner of Samui, ideal for guests who want to be close to the beaches and away from the bustle of city lives. If you wish to explore the neighbouring beaches, the villa offers you the chance to as they are all closely located. You can enjoy the many water activities offered such as kayaking, diving, etc. Some famous spots to check out include the Big Buddha and Wat Plai Laem, another Buddhist temple.